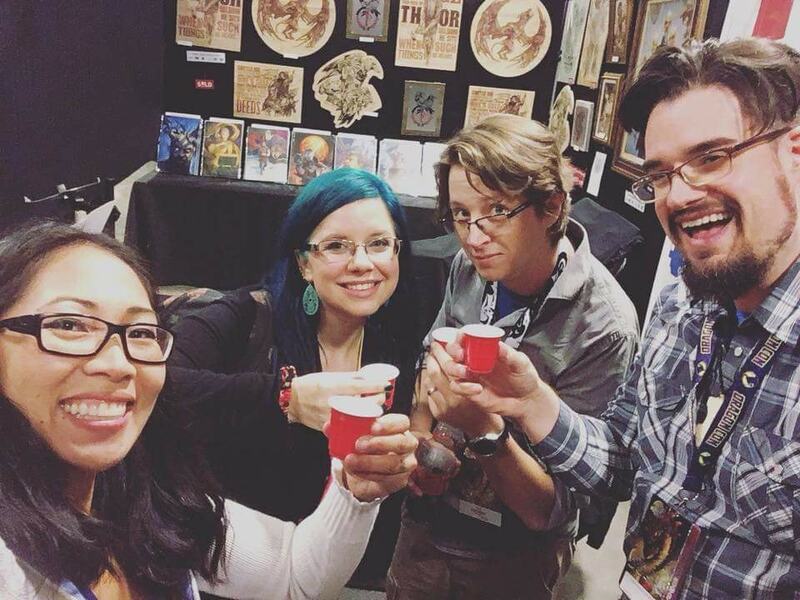 You get to hear Pete and I talk a lot about our booths at cons, but I thought it would be interesting to see it all from someone else point of view, so I invited Heather to write again for our blog. Loraine, Heather, Tad, and Sam toasting the first day’s sucess! I met artist Sam Flegal and his wife Loraine Posadas Flegal at a nearby bar to go over our game plan in person. I would be assisting them in a roomy 10x20 booth on the second floor of the vendor hall. My job was to help sell Sam's Fateful Signs artwork and books to Norse mythology enthusiasts. My husband Tad was also present to help bring us food and drinks during the event. Since I have hired my own convention assistants before, I had an idea of what my duties would be based on what I thought was helpful to me as a seller. But I have to admit, I was still a little nervous by the prospect. This was my first time assisting at somebody else's booth, and Dragon Con was already unlike any other convention I had attended or tabled before. It overtook the entire city, Atlanta had truly become "The City of Dragon Con." But my nerves faded as Sam gave us a tour of the city blocks Dragon Con had claimed as its own. Now at least I knew where I was going! The next day we arrived early at the vendor hall for Sam to show us around the floor and explained the set up to me. When the doors opened we were ready... on a mission from the Gods and Goddesses, foretold in the runes... and our harvest was most bountiful! At the start of our quest Sam and I had several discussions online about the convention to prepare. We both put our wishes and expectations on the table and came to an agreement quite quickly about what my responsibilities would be as an assistant, and how I would be compensated. This is similar to discussions I have had with my own assistants, to make sure everybody is on the same page and expectations are clear from the start. From then on there were several less formal follow up calls to wrap up final details and answer my burning questions about the huge convention! Sam was very gracious about explaining all the ins and outs to me. Sam sent me copies of his books, "The Illustrated Hávamál & Voluspa" as well as his sketch books, so I could research his brand and his paintings. It was A LOT of material, but I knew I wouldn't have to memorize all of it, just key points. I cross referenced the pages in the books that had prints available in his online store to familiarized myself with the story of each one. I have a pretty good memory when it comes to stories, and knowing the basis of each helped me converse with Sam's fanbase on familiar terms, instead of being clueless when somebody asked why Tyr's hand was missing in the painting. A very exciting aspect of this experience was getting to work inside a spacious 10x20 foot booth, 2 inline (not corner booth) 10x10s. There was plenty of space to display a full bounty of artwork, provide variety, and create positive flow for the incoming foot traffic. Above you can see the layout known as "the snake" and how each warrior was positioned for battle. Generally I was stationed in the "gallery" area, ready to greet the travelers as they came to bid thanks to the gods and peruse the artwork. Sam and Loraine were behind the front table guiding customers that were ready to make purchases, wanted to meet the artist, or look at more products. Sam could be signing prints while Loraine prepped bags, took money, and recorded the sales in her trusty binder, and I was greeting the next person entering the gallery. This set up ensured that everybody who wanted one on one attention from Sam could get it without any new wanderers being ignored. The strategic openings in the set up also allowed us to rotate stations easily whenever necessary. Whether it was somebody else's turn to rest their feet in the director's chair, or a collector was eyeing an original in the gallery and Sam was needed to assist, the flow for both us and the visitors was unlike anything I had ever experienced. It was certainly MUCH more productive and painless than previous shows of mine where myself, my husband and my own assistant were squeezing past each other in a cramped 12x5 featured artist booth. Sam and Heather being weird. "Hello! Welcome to Fateful Signs, art of the Gods! All of this art is original work by Sam Flegal (point to Sam who responds with a smile and a wave) based on Norse mythology! All of the prints have stories on the back about the God or Goddess featured in the artwork (pick up and flip over a print to dazzle guest with story- guest coos with delight and reads story). My name is Heather, let me know if you have any questions!" (step back and let the magic happen). This was the pitch I came up with on the fly while in the booth, after a few repetitions I had it memorized and was ready to greet each new visitor. Key points on why this pitch was effective. 1) Identifies who is who -Pointing out the artist instantly creates a human connection to the work and lets the guest know who can help them and how. 2) Identifies the source -Making a personal connection with the guest is key, they want to know if the artwork is "for them.” By saying key words like "Norse Mythology" they instantly know if they have any existing relation or knowledge of the work. Stating that the work is original lets them also know that Sam is creating his own interpretation of the lore, not referencing any existing video games or comics, though those points of interest CAN HELP make a personal connection with the guest. 3) I step back -Nothing makes guests feel more overwhelmed than a pushy sales person. It is for that reason that I would usually wait a few beats before approaching a guest, to make sure they were really interested. I kept my pitch short and sweet, just to let them know their presence was acknowledged, give them context for the work, and let them know I could help them if they need it. Then I step back and let them carry on with their shopping, only checking in if I spot a look of confusion beckoning for aid. As the first day went on I added "Have you ever seen Sam Flegal's work before?" to the start of my pitch, because so many visitors already knew all about him! This let me save time on the people who were returning guests, and hint at newcomers that if they DONT already know Sam, they should! Having an assistant who can communicate and guide the guests gives the artist more time with those that do make purchases, and leaves them more available to give a personal touch for big sales like originals or book bundles. My experience at Dragon Con was so amazing and I learned so much as an attendee and a first time assistant, the rewards were many, and the memories will be treasured. 1) I got paid!- Sam and Loraine did pay me for my time, as well as a meal each day on the convention floor for Tad and I. Sam said that even after factoring in the expenses of an assistant, this was still his most profitable convention. So it was a win win! If you are planning on working as an assistant, or hiring an assistant yourself, discuss together what is fair for you both and what your expectations are ahead of time. Keep in mind the size of the convention and what the artist can reasonably expect to earn there. Because Dragon Con is so huge, having an assistant makes a lot more sense than say, a first year convention. 2) Networking!- I met some pretty amazing people working behind the booth and after hours at dinners. I had the opportunity to hand out business cards and make connections thanks to Sam and Loraine introducing me! I also got to visit the art show several times to reconnect with friends and meet other artists for the first time. 3) A free peek at a huge and expensive convention -Part of my compensation was a free vendor badge to Dragon Con (meaning I got to skip the HUGE waiting lines). I was also lucky enough to share a room with friends who got a hotel comp! Though I was working most of the time, I was still able to explore the rest of convention once the vendor hall had closed each day, usually spending the time at the art show. There was also a hefty break on Monday where I went shopping with Tad in the vendor hall. Before I attended Dragon Con everything about it confused me, now that I've seen it up close with my own eyes I feel better prepared to apply myself next year! 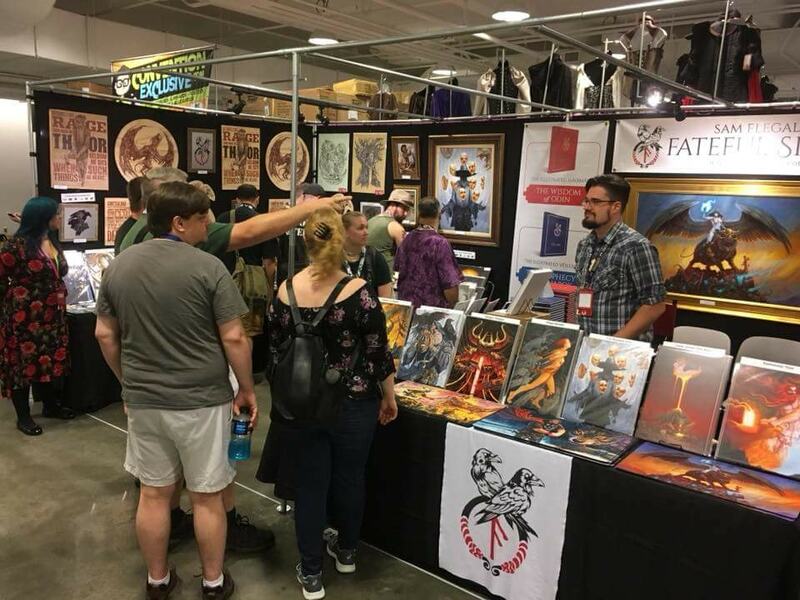 It was a lot of work and my feet were bricks by the end, but I am so happy I partnered with Sam that weekend at his Fateful Signs booth. I learned and experienced so much, and I can't wait for Dragon Con next year! Here's to a very successful Dragon Con 2018 & many more to come!! Heather R. Hitchman is an independent artist working in Kissimmee, Florida; but she was born in the United Kingdom. Her current focus is the world of Terratoff, a fairy tale place where magic is the essence of life, but where "The Rott" threatens to tear the world apart.